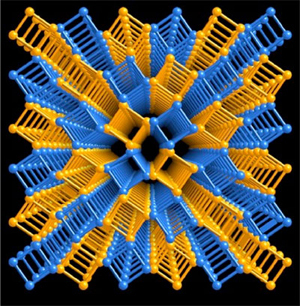 The Center for Nanoscale Science is a Materials Research Science and Engineering Center (MRSEC) supported by the National Science Foundation under grant DMR-1420620. The Center supports collaborative, interdisciplinary research efforts in the area of nanoscale materials. The research themes are focused broadly on nanomaterial synthesis and fabrication, complex oxide thin films, nano- and micro-motors, three-dimensional nanoscale metalattices, and multicomponent assemblies for collective optical and electronic functions. These research themes are integrated with major efforts in educational and industrial outreach. The activities of the Center involve approximately forty-five students and postdoctoral fellows, forty faculty from ten academic departments at Penn State University, and a number of external academic and industrial partners. The principal research activities of the Center are organized into four interdisciplinary research groups (IRGs). The IRGs investigate emergent behavior of nanoscale systems with common themes of new materials synthesis and nanofabrication, theory-led design, and length scale-dependent physical phenomena. The scientific programs of the IRGs are complemented by a highly competitive Seed program. The Seed program has played a major role in the evolution of the Center, supporting new faculty and high risk projects. Seed grants typically support 1 to 3 graduate students over ~18 months. The Seed program leverages co-funding from the Penn State Materials Research Institute (MRI), the Huck Institutes for the Life Sciences, and the Penn State Institutes for Energy and the Environment (PSIEE). The research of the Center is integrated with a broad range of educational and outreach activities that engage all of its members. The Center works in partnership with the Science-U, SEECoS, and NNIN outreach programs, with Chemistry and Physics REU programs at Penn State, as well as with the Franklin Institute, a science museum in Philadelphia. The Center welcomes the participation of non-member students and faculty in its outreach efforts. The Penn State MRSEC operates a Central Facility Laboratory (CFL), housed in Davey Laboratory, that primarily serves the research needs of the four IRGs. The CFL is a node of the Materials Characterization Laboratory, a user facility operated by the Materials Research Institute at Penn State. Other research user facilities that connect to MRSEC through MRI are the Penn State Nanofabrication Laboratory and the Materials Computation Center. The directors of MCL, the Nanofab, and the Materials Simulation Center are active participants in the MRSEC. Both the MRSEC Central Facility Laboratory and the MCL are part of the Materials Research Facility Network (MRFN). Support for the Center for Nanoscale Science is provided through the NSF Grant DMR-1420620, part of the NSF MRSEC Program. Additional support is provided by Penn State University, Materials Research Institute, and by Pennsylvania Ben Franklin Technology Development Fund.